For an overview of the waterjet cutting process, see a previous post here. 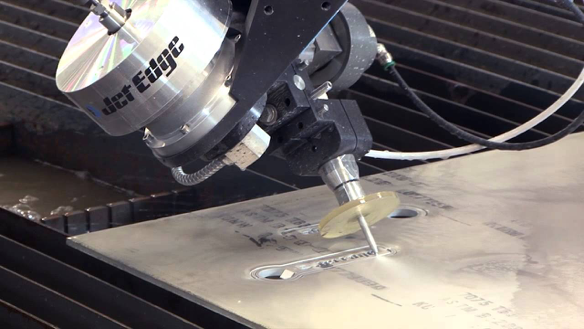 There are a couple critical attributes of waterjet cutting that set it apart from traditional technologies such as, machining, laser, plasma, EDM wire cut, etc. One of its most prominent attributes if the fact that the cost of running a waterjet machine is cheap. After all things are considered its only costs about $14.00/hr to run a waterjet cutter. Then once you add on top the product material cost, Labor hours, profit percentage, etc., you get your final price. There is an additional price if you require the abrasive compound, this can typically range between $0.20-$0.35 per lb and can be used at a rate up to $35.00/hr depending on the power of the pump and amount of time you spent cutting. Apart from the initial running costs, waterjet cutting provides other cost saving benefits such as fast transition time from drawing to cutting, a fast cutting speed and a fast setup time as low tangential forces often eliminate the need for clamping. Because this process uses only water and granite to erode the material it is technically a cold cutting process and any heat that may be produced by the erosion process is instantly cooled by the water stream. Therefore, warping, distortion and material hardening typically associated with laser, plasma and machining is eliminated, minimizing the need for secondary processing. It is also safer for operators and the environment as it produces no vapor or smoke and any dust particles produced by the erosion process is trapped in the water and is filtered out safely later. As mentioned before waterjet cutting is used is almost every industry due to its capability to cut almost any material relatively cheaply, all without altering the properties of the material. Materials ranging from 0.010" acrylic all the way to 10” thick stainless steel can be cut by waterjet. Thin materials can even be stacked to increase productivity and lower costs. These machines are available with various table sizes from 0.5m x 1.5m to 2m x 4m, but some machines are custom made and can incorporate massive table sizes of 4m x 18m and run multiple heads. Tolerances tighter than +/- 0.005" are achievable when using the Q5 finish, especially in thinner materials such as 1" stainless steel, and because the cutting speed can be altered mid cut, it allows parts to have multiple edge qualities. Kerf refers to the material removed by a cutting implement and in this case is dictated by the width of the jet stream. The width of the jet stream is typically 0.04” or 1 mm. The less common microjet waterjet cutting heads have a smaller nozzle and stream width of 0.02 inches or 0.5 mm. Waterjet cutting is primarily a tool for cutting all the way through a piece of material and is rarely used to cut to a certain depth as this is difficult and often inaccurate. However this process has been used for engravings where the depth isn’t very important. With a stream width of 0.04in, it is often assumed that that is the smallest hole that can be accurately made, but this is not so. The waterjet must first break through the material before cutting along the cut line. In this process, called piercing, the machine sends a powerful blast of water and abrasive at the material surface in order to create the initial hole. This initial hole is fairly rough and only once pierced does the cut become smooth. It is for this reason that it is recommended that a hole be 2x that of the waterjet in order to get a smooth and accurate hole, so in most cases it’s not recommended to go below a dimeter of 0.1”. Occasionally you will see small indentations in the part where the waterjet stream begins and ends its cut. The Initial piercing of the material is often done in a section of the bulk material that would be considered scrap, only then does it lead into the part to avoid placing large blow-out blemish from the initial piercing on the part. However, were the cuts meet back together at the lead in - lead out point, a nib may be produced that would need to be removed. There are various types of lead-ins and lead-outs that can be used with for different materials and thicknesses to produce the best finish quality. Number 4 is an example of a straight line lead in with short arc lead-out. Parts cut using ordinary waterjet cutting will have a slight taper along the cut line due to the waterjet cutting stream spreading out as it gets farther from the nozzle instead of travelling in a straight line. This can create different types of tapers depending on the material and cutting speed. 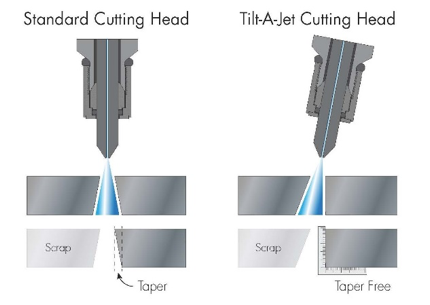 V-shaped taper is the most common type of taper and is caused by the fact that the jet has more cutting energy at the top of the cut than at the bottom and so it tends to make a wider cut there. In general, the faster the cut the more pronounced the taper will be. The reverse taper happens during very slow cuts or in soft materials where the material is rapidly eroded. Because the jet stream expands the farther away from the nozzle it gets, it removes more material from the bottom than from the top. The barrel taper on the other hand usually only occurs in very thick materials. The taper is never worth worrying about when working on parts 1/8” (3 mm) thick or below as the taper is barely noticeable. 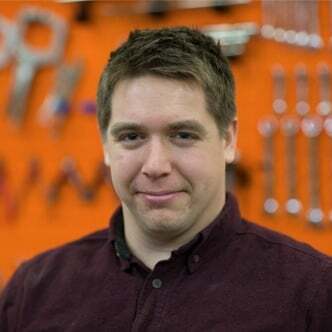 There are methods however that can be used to reduce the amount of taper on larger parts. The primary method as mentioned is through controlling the cutting speed and is usually calculated by the cutting program after the material data is inserted. Another method is through the use of a tilting cutter head to compensate for the spread. However this requires an upgrade in cutting eqipment to be able to follw a curve and tilt the head accordingly to maintain a taper free edge and thus cost will more. Progress in waterjet cutting technology has led to the development of 5Axis waterjet cutting where by attaching a waterjet head to a 5Axis machine brings the advantages of waterjet cutting to more complex 3D parts which would otherwise be timely and expensive to machine. There are two methods to which this is accomplished, the first is where the waterjet cutting head is mounted on a robotic arm, and the second is where the head remains fixed and a cutting table, in addition to an X, Y, and Z travel, can rotate about those axes.